Good behaviour is based on good relations between parents/guardians, child and school. In Rathnure National School, we hope to foster this ideal in co-operation with our parents/guardians. We have adopted a positive code of behaviour with emphasis on encouragement and reward so that good behaviour can prevail in our school. The Board of Management of the school has ultimate responsibility for behaviour in the school. Within the school, the overall day to day responsibility for behaviour rests with the Principal. Each teacher has the responsibility for the maintenance of good behaviour and good order within his/her classroom while sharing a common responsibility for good behaviour within the school premises. Parents/guardians can support the school by encouraging their children to understand the need for school rules, and by communicating any relevant concerns to the school. The adults encountered by the children at school have an important responsibility to model high standards of behaviour, both in their dealings with the children and with each other, as their example has an important influence on the children. Create a positive climate with realistic expectations. Promote positive behaviour, through example, honesty and courtesy. Provide a caring and effective learning environment. Encourage relationships based on kindness, respect and understanding of the needs of others. Ensure fair treatment for all regardless of age, gender, race, ability and disability. Show appreciation of the efforts and contribution of all. To discourage physical aggression and encourage ‘Kind Hands, Kind Words, Kind Feet’. A Code of Conduct for staff, pupils and volunteers ensures that the rights of all are upheld. We wear the appropriate uniform. We follow our Healthy Eating Policy. We listen. We don’t interrupt. We are gentle. We keep our hands to ourselves. We are honest. We tell the truth. We are kind. We share. We work hard. We don’t waste time. We look after property. We don’t damage things. These 6 “Golden Rules” will be the main ones used for infant classes. Rules apply during school-time and during all school related activities. At the beginning of each academic year, the class teacher will draft a list of class rules with the children, based closely on the “Golden Rules”. Class rules will be kept to a minimum and are devised with regard for the health, safety and welfare of all members of the school community. Where possible they emphasise positive behaviour (e.g. ‘Walk’ and not, ‘Don’t run’). Rules will be applied in a fair and consistent manner, with due regard to the age of the pupils and to individual difference. Where difficulties arise, parents will be contacted at an early stage. 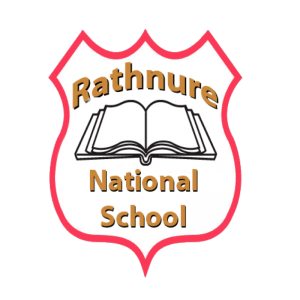 Part of the vision of Rathnure National School is to help children achieve their personal best and thus prepare them for further education, life and work. We recognise that there are many different forms of intelligence and similarly that children use a variety of approaches to solve problems. Our reward system seeks to provide encouragement to all children of all abilities and talents. Children will be encouraged, praised and listened to by adults in the school. Praise is earned by the maintenance of good standards as well as by particularly noteworthy personal achievements. Rates of praise for behaviour should be as high as for work. ‘Shining star’ award or special mention at assembly. ‘Foireann of the month’ award at assembly along with “Foireann of the Term”. Field trips, annual school tours and any special events will be reserved for those who have consistently strived to behave well. The whole school community, including staff have been divided in to four teams, Dearg, Glas, Oráiste agus Gorm. All staff will carry coloured stickers throughout the school. Whenever they encounter a pupil who is behaving particularly well, they may give the pupil a sticker. This sticker is returned to the classroom tally sheet for each team. At the end of each month, the team with the most stickers/points collected will receive the ‘Foireann of the month’ award and each pupil on the team will receive a homework pass or other suitable reward. The team with with most points at the end of each term will receive a special award/treat. These are examples and this is not an exhaustive list. While teachers and staff will place greater emphasis on positive rewards and strategies, there are times when pupils misbehave and sanctions are required. Three levels of misbehaviour are recognised: Minor, Serious and Gross. All everyday instances of a minor nature are dealt with by the class teacher, or the supervising teacher at break-times. In cases of repeated serious misbehaviour or single instances of gross misbehaviour parents will be involved at an early stage and invited to meet the teacher and/or the principal to discuss their child’s behaviour. Leaving school/school activities without permission. It should be noted that these lists consist of examples only: It is not a totally comprehensive list of misdemeanours. Bullying is repeated aggression – physical, verbal or emotional – conducted by an individual or group against another or others. PHYSICAL: includes pushing, shoving, punching, kicking, poking, tripping, etc. VERBAL: name calling which hurts, insults or humiliates. EMOTIONAL: threats or persistent hurtful remarks regarding sensitive areas e.g. appearance, dress, progress, colour, culture and disability. Isolating or shunning a child. Threats to extort money or possessions. “Cyber/text” bullying. The school takes particular care to intervene early in responding to the needs, fears or anxieties of individual members in a sensitive manner. Issues in relation to Bullying are explored continually during SPHE lessons and using Circle Time, Drama etc. Should a parent/guardian have any concerns which need to be discussed with a teacher, all staff members are more than willing to facilitate a meeting, made through the proper channels i.e. a phone call to the office, or a note to the class teacher to arrange a convenient time for both parties. The first person to be informed should be the class teacher. This arrangement ensures that all concerns are dealt with in a dignified, meaningful manner, without infringing on valuable teaching time. Isolated incidents of aggressive behaviour, while not to be condoned, cannot be described as bullying. Incidents of bullying will be dealt with in the same manner as breaches of discipline – already outlined in our Code of Behaviour. In the case where a parent reports a bullying incident, the school reserves the right to inform the relevant parties of the identity of the person making the complaint, when this is deemed necessary. For further information please consult the school’s Anti Bullying Policy. helping them to learn to take responsibility for their behaviour. signal to other students and to staff that their wellbeing is being protected. keep the student, or other students or adults, safe. The following steps will be taken when a child behaves inappropriately. The list is by no means exhaustive. Teachers may put in place alternative measures bearing in mind the circumstances involved. The aim of any sanction is to prevent the behaviour occurring again and if necessary to help the pupil devise strategies for this. This is not an exhaustive list of sanctions. Usually sanctions will relate as closely as possible to the behaviour. In Rathnure National School the system of white cards, yellow cards and red cards will be used. A white card will be given to a pupil in the case of a serious misbehaviour or continuous minor misbehaviours. A list of misbehaviours is printed on the card and the relevant one will be marked by the teacher. An account of what happened may also be written on the card. This card will be signed by the teacher and parent and will then be retained in the school. If a pupil has received 3 white cards they will then receive a yellow card. A meeting will be arranged between parent(s) and the classroom teacher to discuss the child’s behaviour. The parent(s) will be asked for their co-operation in helping the pupil to improve their behaviour at school. If a pupil receives a further 3 white cards they will then receive a second yellow card. A meeting will be arranged between the parent(s), class teacher and the principal. Again the parent(s) will be informed that the pupil is in breach of the school code of behaviour. They will be informed that the next step will involve the chairperson of the Board of Management. If a pupil receives a further 3 white cards they will then receive a third yellow card. A meeting will be arranged between the parent(s), class teacher, principal and also the chairperson of the Board of Management. If a pupil receives a further 3 white cards they will at this stage receive a red card. The pupil may then be suspended for 3 days under Rule 130 (5) for national schools. If a pupil receives a further 3 white cards, they will receive a second red card. The pupil may then be suspended for 10 days with written permission for the Board of Management. The benefit of the card system is that because the card must be signed by the parent(s), they are informed as soon as there is an issue with their child’s behaviour. While every effort will be made to follow the steps in the above order; in cases of serious misconduct, the school may begin sanctions on a higher step e.g. a yellow card or red card may be imposed for an incident of the teacher/principal feels it is warranted. Class teachers will keep a written record of instances of misbehaviour and also a record of improvement in the behaviour of pupils. Every pupil will begin with a clean slate at the beginning of each school year. For gross misbehaviour or repeated instances of serious misbehaviour suspension may be considered. Parents concerned will be invited to come to the school to discuss their child’s case. Aggressive, threatening or violent behaviour towards a teacher or pupil will be regarded as serious or gross misbehaviour. In the case of gross misbehaviour, where it is necessary to ensure that order and discipline are maintained and to secure the safety of the pupils, the Board may authorise the Chairperson or Principal to sanction an immediate suspension for a period not exceeding three school days, pending a discussion of the matter with the parents. However, a Board of Management may wish to authorise the Principal, with the approval of the Chairperson of the Board, to impose a suspension of up to five days in circumstances where a meeting of the Board cannot be convened in a timely fashion, subject to the guidance concerning such suspensions. Expulsion may be considered in an extreme case, in accordance with the Rule for National Schools and the Education Welfare Act 2000. Rathnure NS will follow the NEWB Guidelines in the case of expulsion. Following or during a period of suspension, the parent/s may apply to have the pupil reinstated to the school. The parent/s must give a satisfactory undertaking that a suspended pupil will behave in accordance with the school code and the Principal must be satisfied that the pupil’s reinstatement will not constitute a risk to the pupil’s own safety or that of the other pupils or staff. The Principal will facilitate the preparation of a behaviour plan for the pupil if required and will re-admit the pupil formally to the class. All children are required to comply with the code of behaviour. However the school recognises that children with special needs may require assistance in understanding certain rules. Specialised behaviour plans will be put in place in consultation with parents and the class teacher, learning support/ resource teacher, and or principal will work closely with home to ensure that optimal support is given. Cognitive development will be taken into account at all times. Professional advice from psychological assessments will be invaluable. Communicating with parents is central to maintaining a positive approach to dealing with children. Parents and teachers should develop a joint strategy to address specific difficulties, in addition to sharing a broader philosophy which can be implemented at home and in school. A high level of co-operation and open communication is seen as an important factor encouraging positive behaviour in the school. Structures and channels designed to maintain a high level of communication among staff and between staff, pupils and parents have been established and are being reviewed regularly. Parents are encouraged to talk in confidence to teachers about any significant developments in a child’s life (in the past or present), which may affect the child’s behaviour. This policy was reviewed and updated in December 2018. It was ratified by the BOM on 10th December 2018.